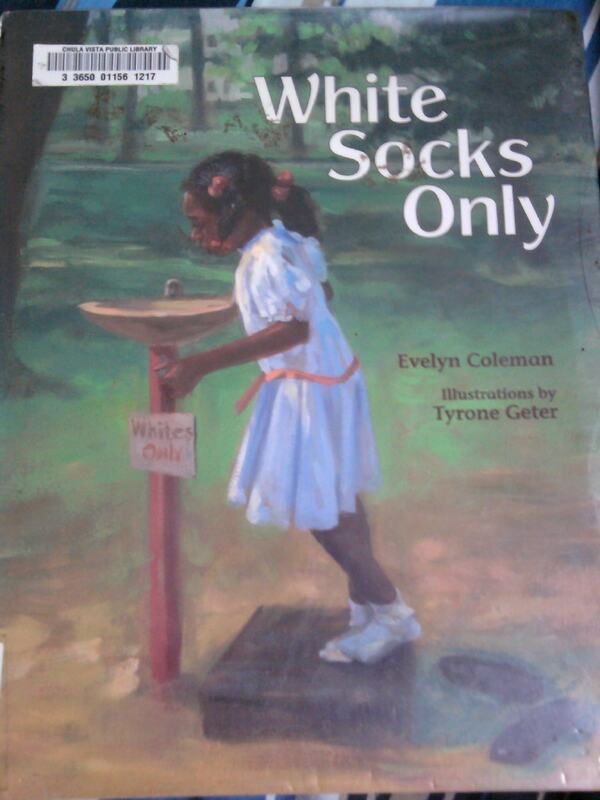 I discovered Evelyn Coleman’s White Socks Only while browsing through this website that features a list of picture books by and about African Americans. 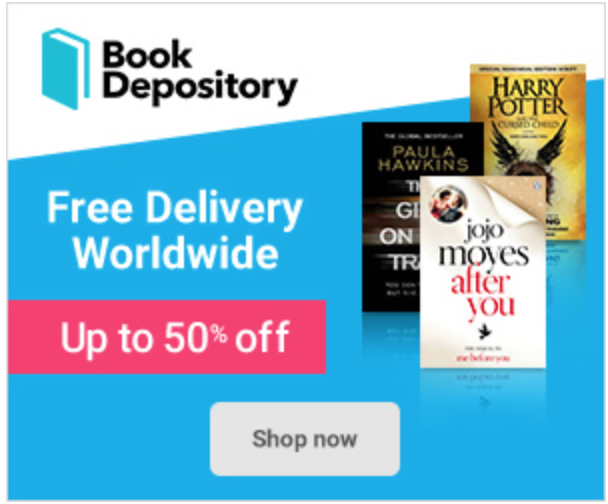 Luckily, it was available in our local library, and it is my pleasure to write a short feature about it as part of our Black History Month special. 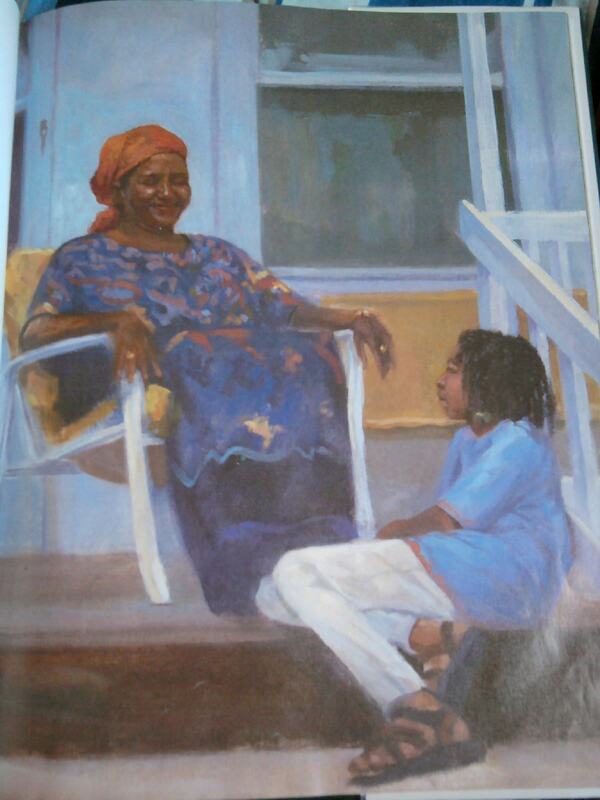 Another thing worth mentioning is how artist Tyrone Geter portrayed the grandmother. She was clothed in a brightly-colored blue dress that reminded me of traditional African clothing. It was paired with a bright orange bandanna that complemented the colorful pattern on her dress as well as her jewelry. Certainly not your typical grandmother. And So Grandmother’s Tale Begins. The power of vernacular language continues as the grandmother spoke of a time when she was a little girl like her grandchild and decided to walk into town by herself, and not planning to do some good. I sneaked on up that road a’singin, “Jump back Sally, Sally, Sally. Walking up the alley, alley, alley” to nobody but myself. And child, was it hot! On that kind of a day a firecracker might light up by itself. Little Sally was a curious and playful little girl indeed. She went to town on a sizzling hot day to see if she could fry an egg on the sidewalk, as she had heard the folks say. I watched that egg like the old men watch the checkers before making a move. For a minute I thought it wasn’t gon’ do nothing. Then… I saw it. One little bit was turning white. Next the white creeped wider and the yellow began to bubble… I jumped up and started dancing and prancing. Well, I knew what that meant. So I sat down in the grass and took off my shiny black patent-leather shoes. Now I only had on my clean white socks. I stepped up on that stool with those white socks hugging my feet. For an emotional junkie such as myself, that scene was deeply moving. Little Sally was the epitome of innocence. Although she “wasn’t planning on doing no good,” she was a good child. The scene that followed was a test of her goodness. 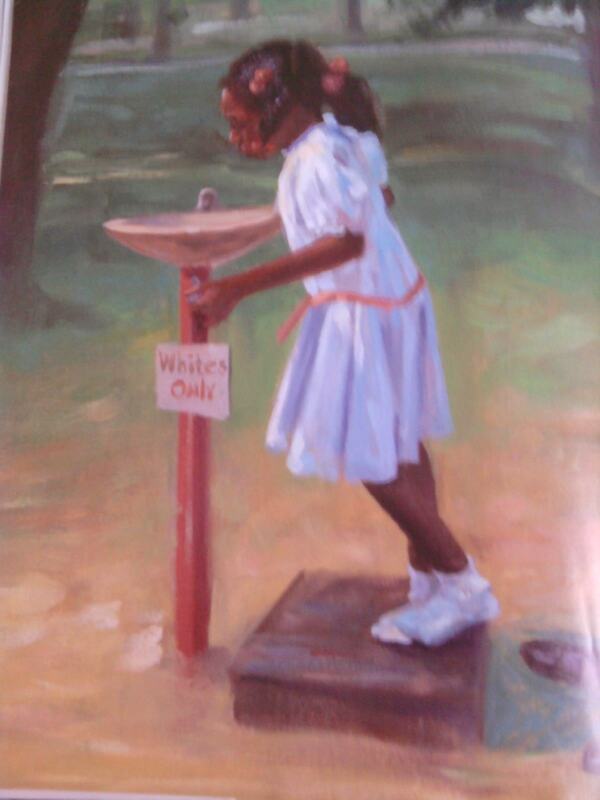 Little Sally’s bravery led other black folks to drink from the fountain. Even during this scene, one can clearly see little Sally’s innocence. They had on clean-looking green socks and yellow socks and red socks and blue socks. Of course, the big man with the bandanna kept right on yelling. His face got red as fire. He was snorting through his nose like a bull does when it’s gon’ charge. 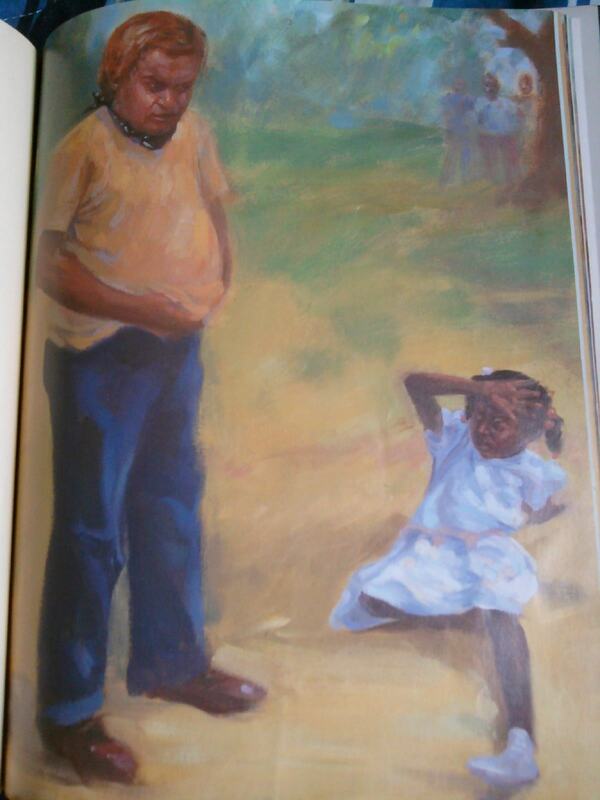 The big white man started hitting little Sally and everybody else at close range. But poor little Sally only wanted a drink from a fountain! When everything seemed hopeless, a man known in town as the Chicken Man walked through. Without saying anything, he pointed a finger at the white man. It was the last time they had seen of him. From the on, the “Whites Only” sign was removed from that water fountain forever. An Afterthought. White Socks Only is my first Evelyn Coleman book. She certainly has a way with words and her powerful storytelling is brimming with magic and charm. 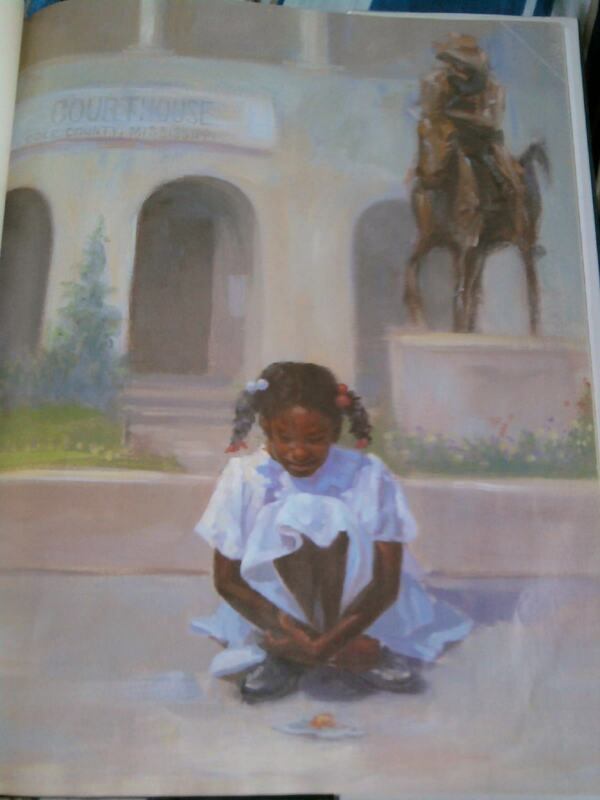 It is worth noting that this book was inspired by her memories of places she could not go to and things she could not do because of her skin color. One day our descendants will think it incredible that we paid so much attention to things like the amount of melanin in our skin or the shape of our eyes or our gender instead of the unique identities of each of us as complex human beings. 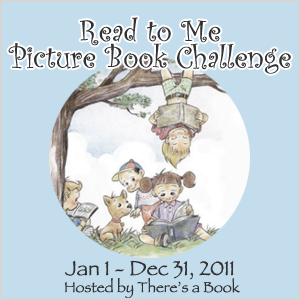 ♥ I so have to find a copy of this! It sounds wonderful! I’m so glad I found this. 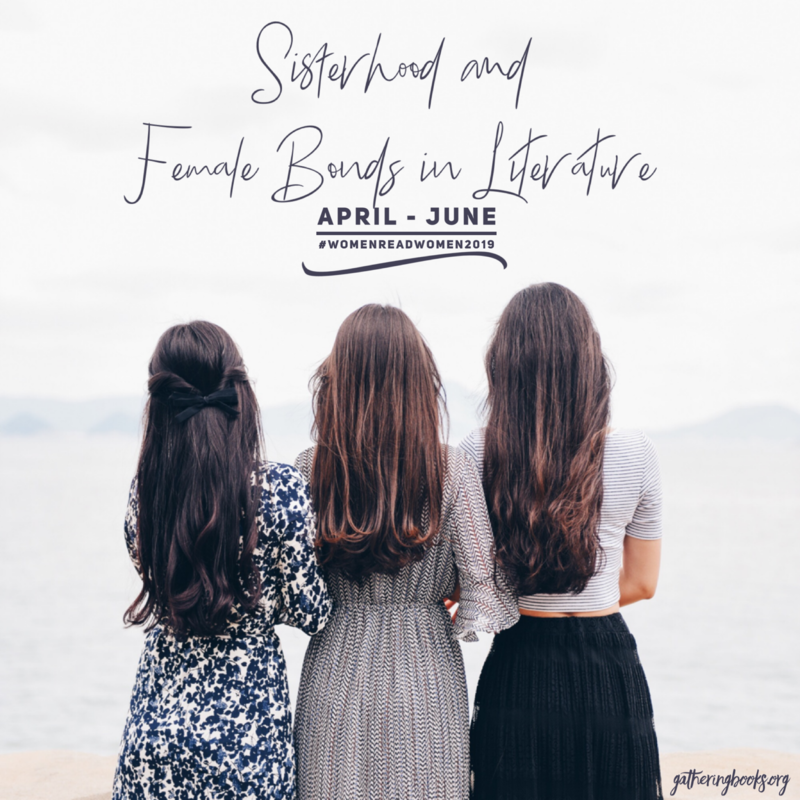 I grew up a military brat living in various places and experiencing many cultures.. While living in New Orleans we used to sing this song about Sally. I always wondered who she was and what was she about. How nice to finally know. I remember being the only hispanic in the all white school and looking right across the street wondering why all the black kids weren’t mixed with us and us with them. The following year we were all together teaching each other songs and games. As I recall a word or two in the song were in french. Cajun influence? I keep researching… Great memories. Thanks for sharing this! Hello Teresa. Thank you for dropping by. I, too, am glad for your discovery. It was nice of you to share these things; it’s very humbling to hear a similar experience, even though it wasn’t exactly you who were in Sally’s shoes. Also, I’m happy that you found the ‘answer’ you’ve been looking for. I use this book every year. I love the powerful message of a child’s innocent misunderstanding of the “white only” sign. Thanks for highlighting this wonderful book.